The Environment Agency’s mission is to create a better place for people and wildlife. And that is exactly what we’re doing through our work on a Sustainable Drainage Scheme. Recently, I visited a fabulous example of such a project in Slough, Berkshire. The Salt Hill Stream is currently blighted by litter and suffers from erratic water levels. During hot weather this summer, parts of the stream dried up, killing fish, while at other times it is liable to flood. Experts will work with local people to design the new wildlife areas over the coming months, so that they help address these environmental problems. They will start creating the wetlands this winter. The Sustainable Drainage Scheme will turn it into a better place. A Sustainable Drainage Scheme – the technical term is SuDS - sounds boring. It isn’t. Done right, it can create astonishing effects. A SuDS scheme can reduce flooding, improve water quality, create better habitats for wildlife and produce better, more beautiful places for people. It can even improve physical and mental health, because there is compelling evidence that people who are near to nature, who live near green spaces, live longer, healthier and happier lives. The scheme in Slough can do all of those things. It is not just going to benefit the people who live there. It is also showing the way forward for the whole country. More and more communities are looking at Sustainable Drainage as a way to reduce flood risk and improve the environment. Just as important as what we are doing is how we are doing it. At a time when everyone’s resources are stretched, the way to do really ambitious things is to do them together. And the people who know best what works for their neighbourhood, for their community, and their green spaces are the people who live there. They need to be at the heart of designing and making changes to the place in which they live. Everyone involved with this project is contributing something unique. 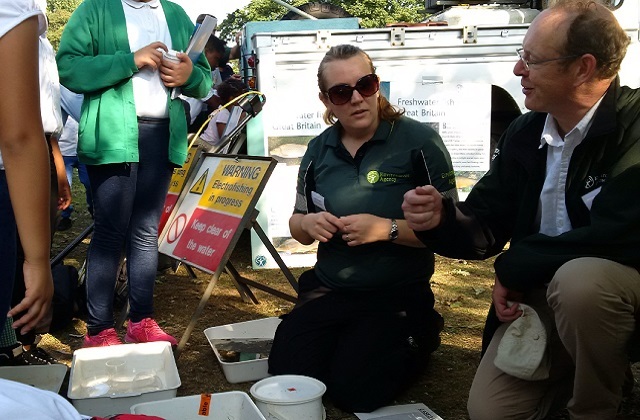 The Environment Agency is contributing our passion, our technical knowledge, and funding. The Wildfowl and Wetlands Trust, with whom we have a close partnership up and down the country on some fantastic projects, know more about wildfowl and wetlands than anyone else. Thames Water have world-leading technical expertise on water quality and quantity, and are committed to improving the environment. David Lindo is one of the UK’s biggest experts on birds and literally wrote the book on birds in an urban environment (“The Urban Birder”, £9.99 and five stars on Amazon). 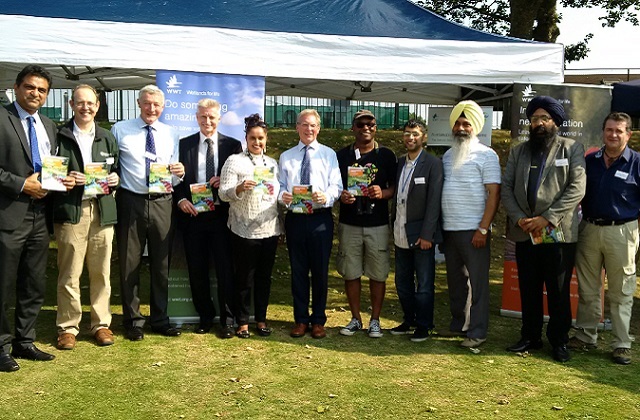 Slough Borough Council understand the needs and wishes of the people of Slough. Local businesses have made a generous contribution to the scheme and the work of many community volunteers has been key. This partnership way of working is the future. In the modern world, where everything is interconnected, whatever we want to do, we can only do it really successfully if we all do it together. There is one other thing about this project that points towards a better future and makes me optimistic. That is that at the heart of this project is the next generation. At the heart of this project are the local schools and the children of those schools, who will participate over the coming months and years in building, studying and enjoying the new wetlands and habitats the project will create. What kind of country we have in the next few years depends largely on people of my generation, and on the work of the Environment Agency and many other organisations who work in this field. But what kind of country we have over the next few decades depends on the children in Slough, and all the other children in school now, up and down the country. If those children grow up with a love of nature, an understanding of how we can make it better or worse, and a determination to make a difference themselves, then the future is a bright one. I look forward to a time when we can go to a SuDS scheme around a mainstream development and say exactly the same!